As you might know, we rarely do discount actions or other gimmicks of the sort. And when we do, there is usually a good reason. Well, this time, there are two. In general, we are aiming to have the new webpage ready by early September (it will be the difference between the stone age and the space era!) and the more stuff we can get rid of, the less the work of entering new items into the new shop. So, look for quite a few discount actions over the next few weeks. In particular, we begin again by drastically reducing the jacket prices. Why? Because we are again working on the newest round of jackets (mainly sweatjackets) for this Fall. Some new designs, some classics will be back, all are incredible. „Retro“ Sweatjackets, „Work 2.0,“ and „Fire and Ice“ Jackets Arrived and Available Immediately! 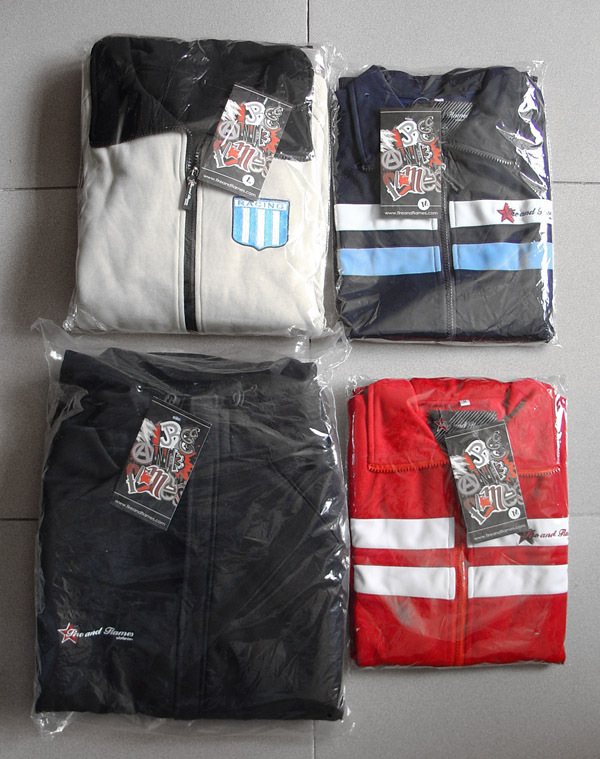 The four remaining new jackets arrived yesterday!! This means the „Fire and Ice“ jacket, the „Retro“ sweatjacket blue, as well as „Retro“ sweatjacket red, and the much anticipated „Work 2.0″ reversible jacket. -Spring is still several months away, and since these are fall/spring jackets, we are in that regard several months early! -After the problems of the last delivery (the „Red Heat/Red Stripe“ jacket being great, but sadly too small and the „Waterproof“ reversible jacket being such a disaster that we have chosen to take it offline) we can very happily say that all of these jackets are simply excellent, and precisely as we intended them. We couldnt be more pleased, and we are sure you will be as well. -Finally, stressful for us but good for you: We try to avoid sales, discounts, and other such marketing tricks. In this case however we will offer one out of necessity. All these new jackets were very expensive, we havent finished paying for everything, and we only have another few weeks to do so. For this reason, the jackets are all significantly cheaper for the whole of January, and will go to their regular prices in February. You help us, we help you! Enough talking, lets take a closer look at each jacket individually. If you follow the links, you will find further pictures, as well as detailed size charts for each jacket. Innovation is the key word here. The jacket is not only, as the name implies, resistant, strong, and indeed durable, but also has a small little innovative touch, namely in the ski mask/hassi which is on its inside but can be detached, thrown away, and replaced. This jacket will keep you dry, it will keep you warm (not quite a winter jacket, but this plus a sweatjacket should be enough in most weathers), and keep you looking stylish! -Outer side of jacket made of heavy duty polyester, wind and water resistant! -Adjustable and removable hood (with zipper), with fleece inner lining. -Two outside pockets with zipper. -Wind flap over main zipper with black on black plastic embroidery. -Hidden,detachable, and replaceable ski mask/hassi, made out of light lycra textile. -“Fire and Flames Riotwear“ embroidery on left chest. The newest version of our much loved sweatjackets, in dark blue, light blue, white color combination. Very sturdy and resistant polyester fabric, soft inner lining, and embroidered red star with blue „Fire and Flames Riotwear“ emblem. Same great jacket, different color. The corrected version of 2008s „Work“ jacket, which many of you have been waiting for for years. This jacket is 100% cotton, and meant very much for utilitarian purposes. The black side is completely black, with no color markings whatsoever. The „Fire and Flames“ emblem on the chest is embroidered black on black, and even the „Fire and Flames“ zipper pull is black on black. The reverse side is made to make you look like a fine elegant young gentleman/woman, with a beige color and a non-descript light blue and white emblem (of Buenos Airess glorious Racing Club! ). Finally, the pockets are on the BEIGE side! It wont just keep you warm, it will also help keep you safe! PS Nur so am rand….blogsport ranking…10th place. Du browst gerade in den Fire and Flames Weblog-Archiven nach dem Tag 'sweatjacket'.